Many variables, including engineering constraints, costs, and environmental impacts are factors when deciding which construction method to use and bridge type to build. 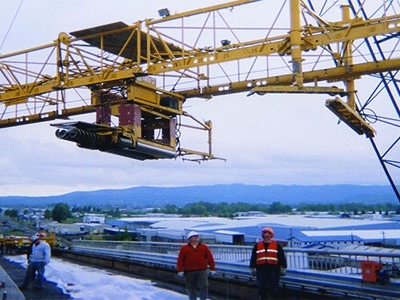 Bridge construction has evolved to reduce traffic impact, facilitate building in congested areas, reduce overall construction schedules, and improve the long-term service life of structures. Rapid Set® and Komponent® are used for bridge decks, overlays, patching as well as closure pours, hinge joints, and approach panels. Eliminating joints has long been an objective of the Federal Aviation Administration (FAA) that regulates airport runways and taxiways. Joints are usually the locus of spalling, which not only causes bumpy rides but also creates a haz­ardous situation: loose concrete fragments can get sucked into jet engine intakes. 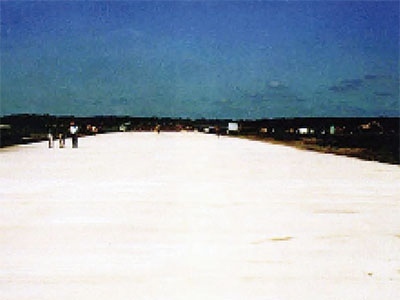 It was the desire to solve the problems caused by joints that led the FAA to construct one of the most unusual concrete slabs in the world at the Rockford, IL airport in 1993. 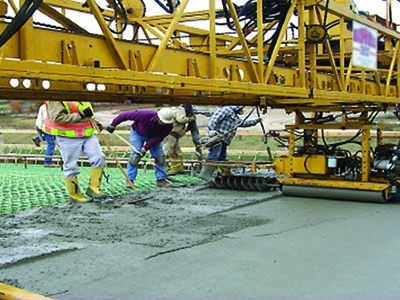 It is a 75 ft wide x 1,200 feet long, post-tensioned pavement made with fibrous shrinkage compensating concrete using Type K shrinkage-compensating cement. There are no joints cut into it. The specification called for a compressive strength of 3,000 psi prior to opening to traffic. 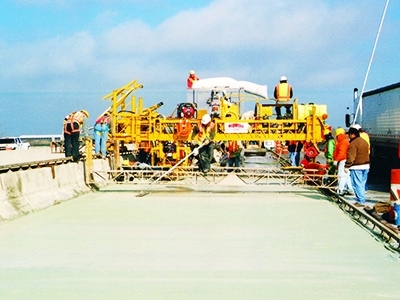 The Rapid Set Latex-Modified Concrete overlay achieved this strength within three hours of placement, allowing the bridge to open for traffic each evening, meeting the DOT’s requirement. Product used was RSLMC. Wider use of proven technologies that eliminate or reduce concrete cracking in old or new decks can reduce the billions of dollars spent annually in the United States on repair or replacement of bridge decks damaged by chloride-induced corrosion. Products used include Type K shrinkage-compensating cement and RSLMC. 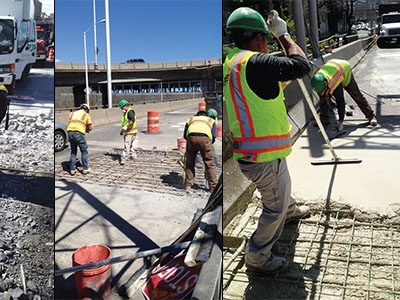 DOTs are tasked with deploying new techniques and new products to extend pavement in timeframes that reduce traffic interruptions and lane closure times. Rapid-hardening cement helps them meet this challenge, since it sets and gains strength rapidly. Products used include Cement All, Mortar Mix, FLOW Control, Low-P Cement, and Rapid Set Cement. In 1968, the State of Ohio began testing Type K concrete in bridge decks with impressive results. 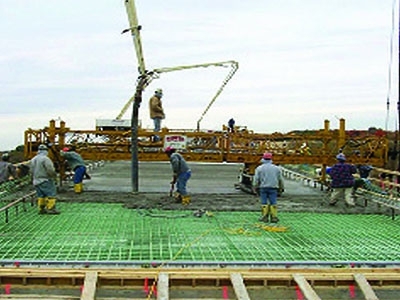 In 1984, the Ohio Turnpike Commission began a program of bridge deck replacement; since 1985, all deck replacements have been performed with Type K concrete. 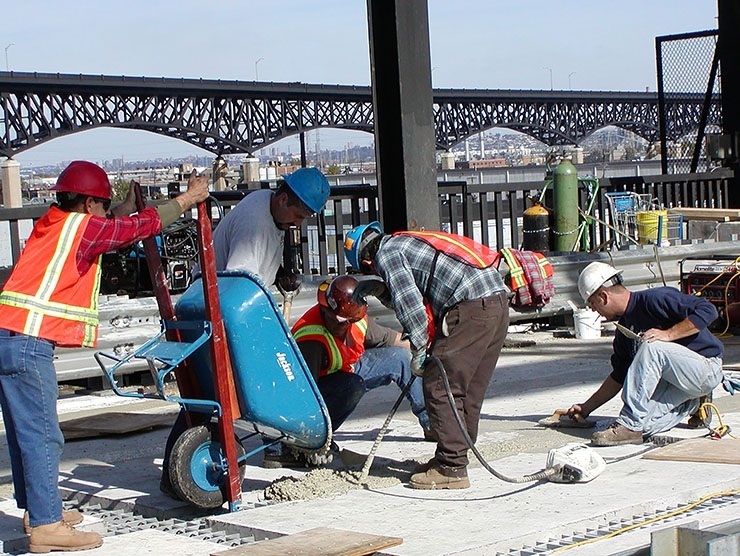 In the years since, other states, including Indiana, Michigan, Ohio, and Pennsylvania, have also adopted the use of Type K cement in bridge decks. 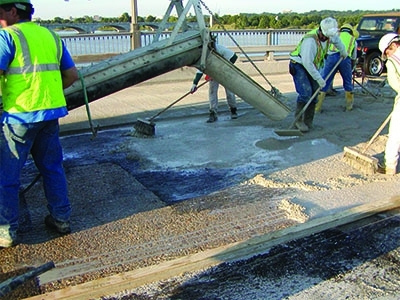 Missouri’s largest bridge improvement project benefitted from fast-setting grout. The keyways were grouted with Cement All because it showed high early strength and excellent bonding characteristics during mock-up testing. The final evaluation of the bridge indicated that using a fast-setting, high-strength, nonshrink grout was a success. The bridge scored the highest possible NBI rating of 9-9-9. The George Washington Bridge carries more than 106 million vehicles a year, making it the world’s busiest motor-vehicle bridge. The pothole-riddled north- and south-bound access ramps that connect the bridge to New York State Route 9A needed to be repaired. The Port Authority needed to reopen the busy ramps in a timely manner to not disrupt traffic patterns. Products used include Concrete Mix and DOT Cement. 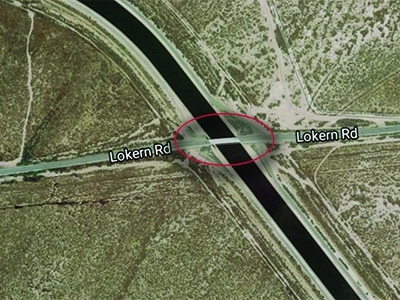 Following is a brief history of the Lokern Road Bridge Rehabilitation project where Komponent shrinkage-compensating cement additive was used to minimize or eliminate drying shrinkage cracking. Product used was Komponent. 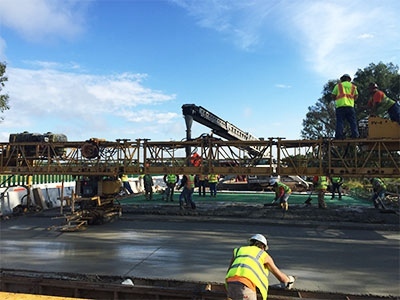 The New Hampshire DOT was constructing a new bridge on I-93 in Concord and wanted a grout that would provide fast-setting strength and be easy to use. Product used was Cement All. Several elements were in need of replacement or repair, including nearly 13,000 sq feet (1,200 sq meters) of patching for the 54-year-old concrete bridge deck. Because the bridge could not be shut down during repairs, a quick-set mortar was specified for the patching material. Product used was Cement All. After 18 months of partial closures, the Lewis & Clark Bridge reopened six months ahead of schedule with the use of a high-performance, rapid-setting, latex-modified concrete (RSLMC) overlay. 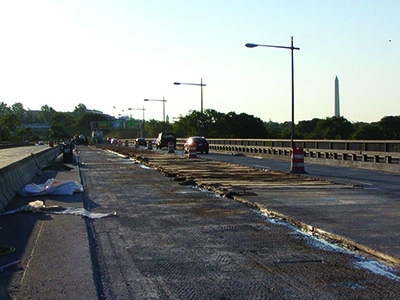 The cement used in concrete can have a lasting impact on the life span of new concrete bridge decks. 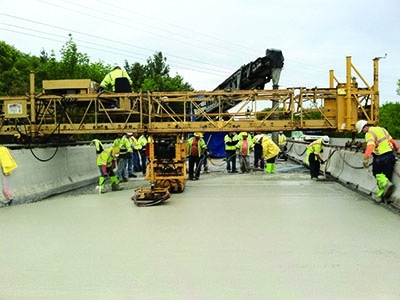 Learn how Type K cement for new bridge construction and rapid hardening cement for repairs and new overlays can help extend the useful life cycle of concrete bridge decks. 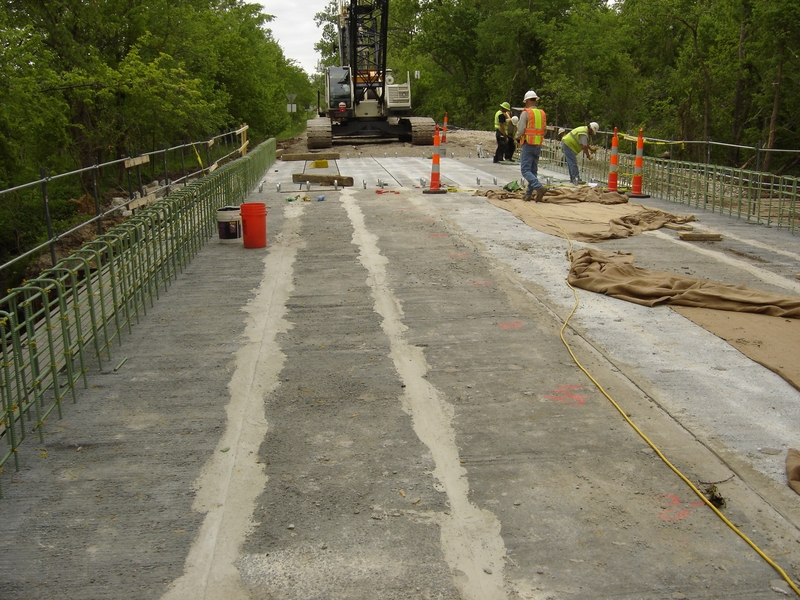 Special cements allow for quicker, long-lasting concrete bridge and deck repairs. After 20 years in service, six Type K cement bridge decks constructed in the early 1990s have proven their exceptional durability and crack mitigation performance. Shrinkage compensating concrete bridge decks are very low cost to maintain due to no deck delaminations, spalls or steel corrosion. 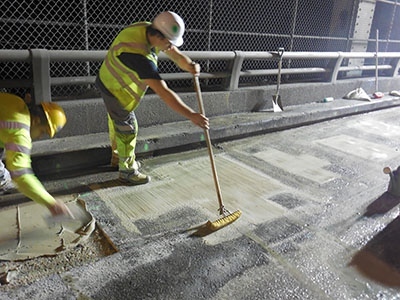 Because of the high traffic volume on the Route 95 bridge, MassDOT developed a unique solution to complete deck repairs over the course of two weekends. Product used was Low-P cement. 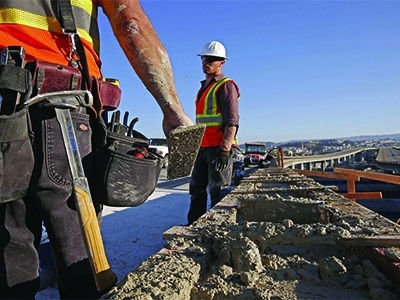 The I-280 bridge hinge joints are designed to slide and rotate, providing the 6-mile-long concrete structure the flexibility and stability to withstand an earthquake. The worn-out hinges on the bridge were replaced with hinges better designed to handle seismic forces. It was planned long before the Napa earthquake, which caused no damage to the structure. Product used was Rapid Set Cement.